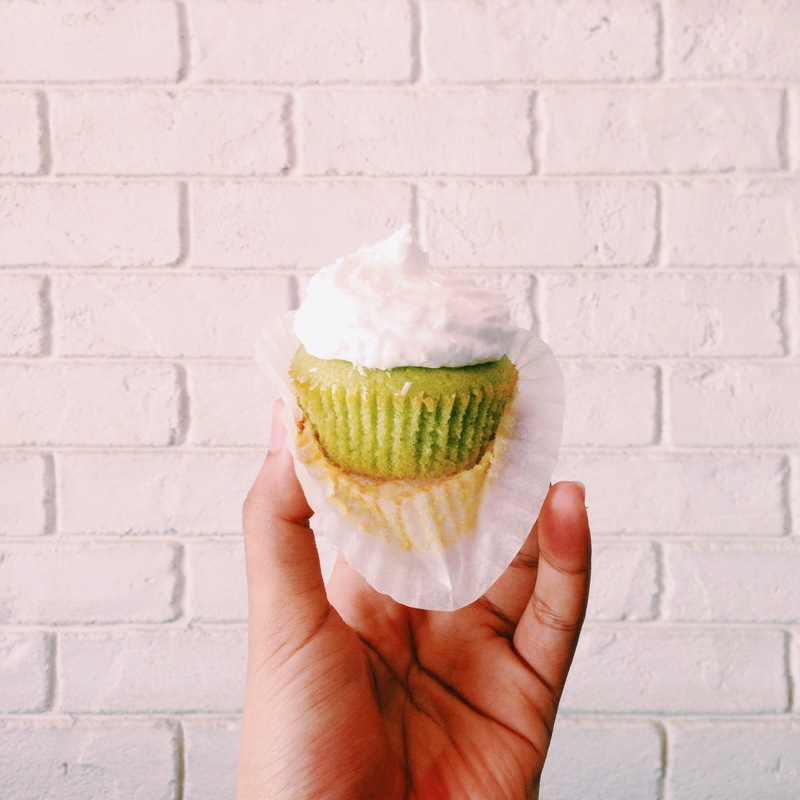 Lately, there has been a craze for kampung cupcakes in Singapore. Furthermore, since Halalfoodhunt has been running for the past six months, people have been coming to me to ask for such kampung cupcake recipes. Alright, let pause for a while and allow me to explain what kampung cupcakes are. Kampung cupcakes are cupcakes inspired by flavours of traditional Malay kuih such as ondeh-ondeh, kuih talam, putri salad and many more. 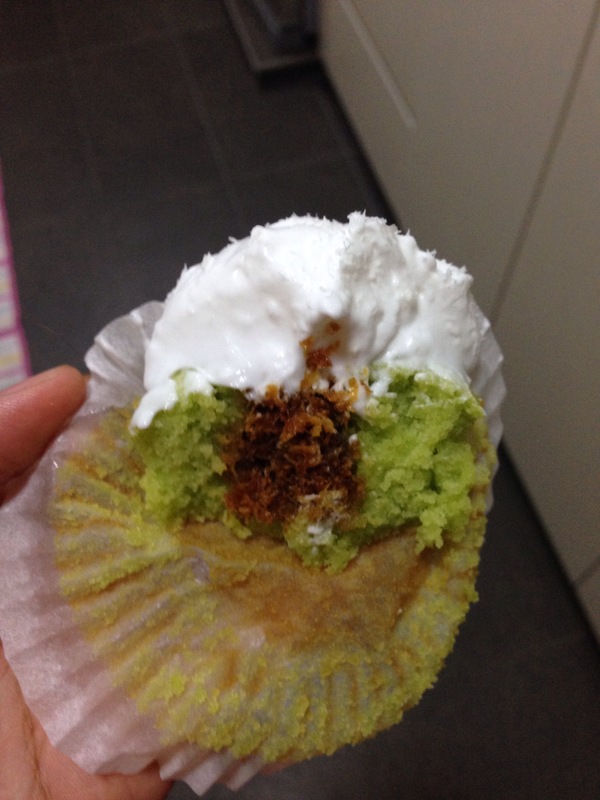 When I first discovered about kampung cupcakes, I was apprehensive about making them. As much as I appear to be modern and all, I still love my traditional Malay kuih the way they are. Then, I succumbed to peer pressure and relented. I had to try making this ondeh-ondeh cupcake, especially since Fluffbakery keeps having their sold out. I totally winged this recipe. I made minor adjustments to a vanilla cupcake recipe, and basically followed my gut. So before I forget the recipe (I have a habit of not taking note of my recipes), here it is. Feedback from my friends is that the taste of coconut is not overpowering, and the infusion of gula melaka and real pandan extract makes you forget you’re eating a cupcake. I hope this recipe will work fine for you! Blend the pandan leaves and water together in a blender. Strain the pandan juice through a fine sieve, or a cheesecloth if you prefer. Squeeze out as much juice as you possibly can. Sieve flour, baking powder and salt through a fine sieve. Set aside. Beat butter and sugar together until white and fluffy. Add flour mixture, alternating with milk and the pandan extract. Scrape down the sides of your mixing bowl and beat for another minute or two until the batter is well incorporated. Divide the batter equally into a muffin tin that has been lined with cupcake liners. Bake in the oven for 15 to 17 minutes, or until a skewer inserted comes out clean. Ensure that the cupcakes are cooled down to room temperature before you core and fill them. In a pan, add the water to the gula melaka and let it simmer on the stove for about 10 minutes, or until all the sugar has been dissolved and the sugar solution thickens. Let cool to room temperature before adding the desiccated coconut and mix it well. Beat whipping cream with sugar and vanilla on medium high until stiff peaks. Gently fold in the desiccated coconut into the cream. To assemble, core the cupcakes, then fill in with the filling and pipe the coconut whip cream on top as desired. Last week, my family and I celebrated my mum’s 59th birthday. 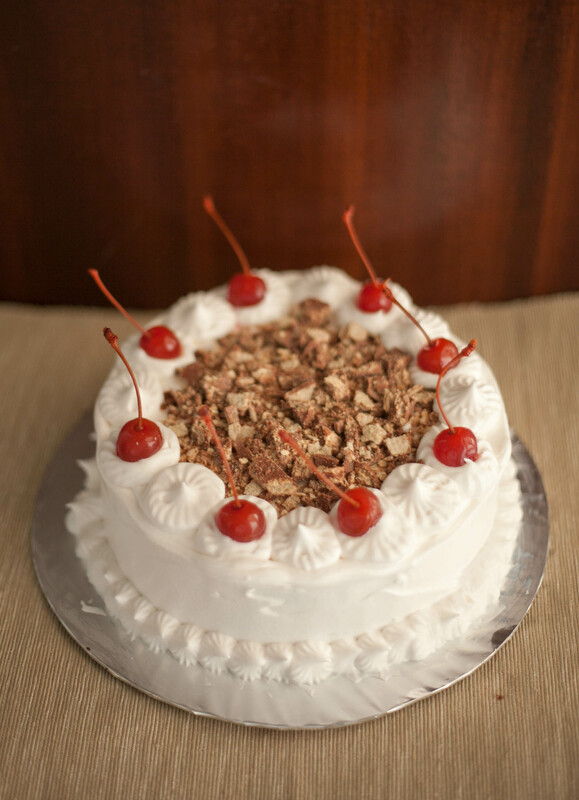 Ever since I embarked on a baking journey, my mother has been bugging me to bake her favorite cake – The Black Forest. 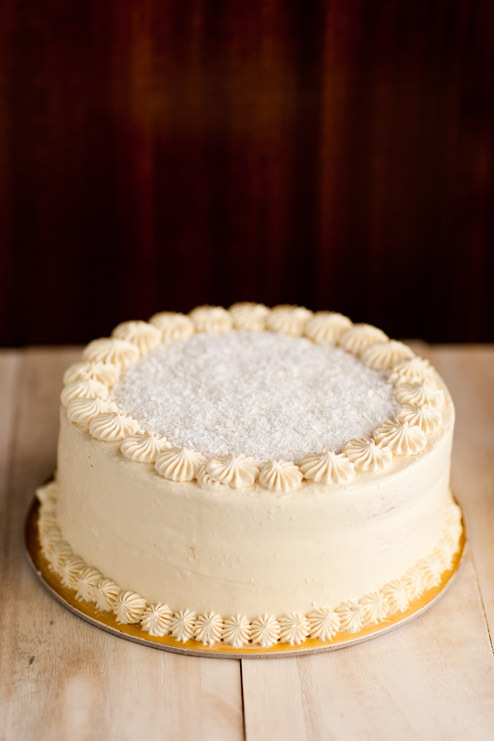 We used to buy them from neighborhood bakeries, not bothering about the contents of the cake. 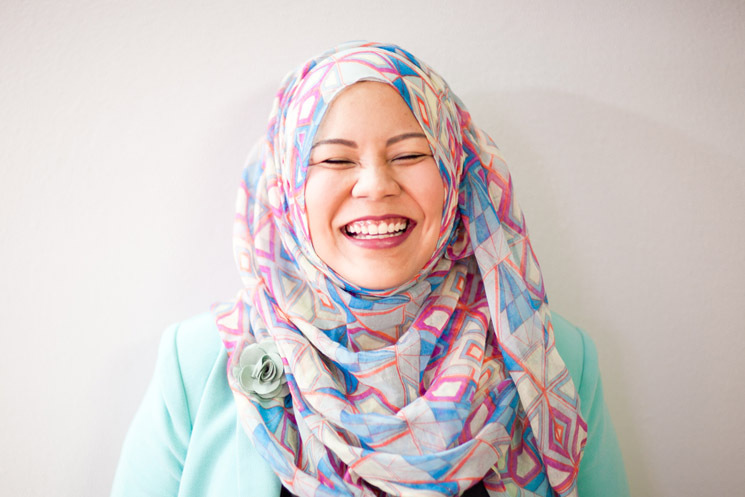 Learning to cook and bake has made me a more conscious eater – both in terms of what I put in my mouth, and in terms of halal ingredients used. I know some bakers might disagree with me, but I am still reluctant to use vanilla extract, or anything that contains alcohol. So upon learning that most Black Forest recipes use Kirsch, a kind of brandy, I stayed clear of them. My mother has been deprived of her favorite cake because of this although the durian cake I made last year was quite a hit with the family. Finally, this year, I mustered the courage to make her favorite cake. I was intimidated because I thought it would be very difficult. Little did I know I just needed a good recipe, and patience to make the cake. I got the chocolate sponge recipe from Sailu’s Kitchen, and adapted it to make it extra tasty. The whipped cream frosting is my own, and I got the maraschino cherries from Phoon Huat. Mix the coffee and hot water together and set aside. Beat melted butter, sugar and vanilla essence till well combined and sugar has dissolved. Beat in eggs slowly until well incorporated. Sift flour, cocoa powder, baking soda and powder and salt. Add into the batter slowly. Gradually add in the milk and coffee into the batter until well combined. The batter will be very watery, DO NOT WORRY. Divide the batter into the two tins. Bake in the oven for 35-40 mins, or until skewer comes out clean. Leave the cake to cool for at least two hours before layering. Meanwhile, beat whipping cream, sugar and vanilla on a medium speed for about 5-6 minutes. I realised 7-8 minutes may be a bit too long, so do watch out for the cream before it becomes butter. Chop about 10 cherries into small pieces. 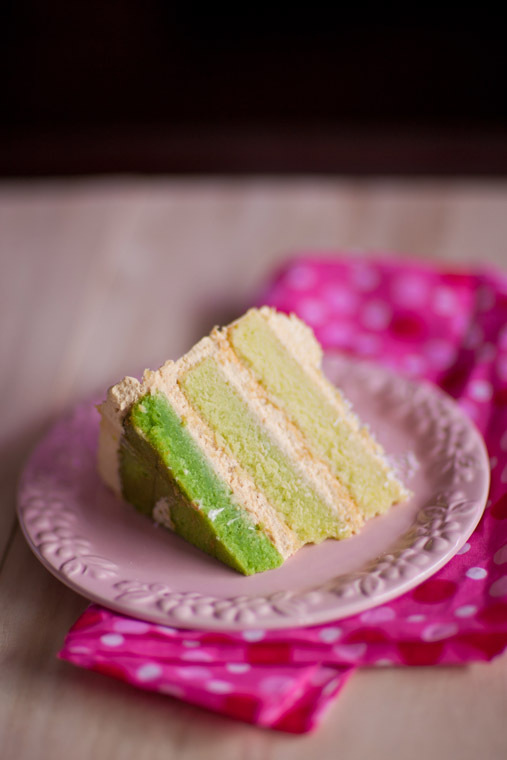 When cake has cooled down, cut the cake into layers. 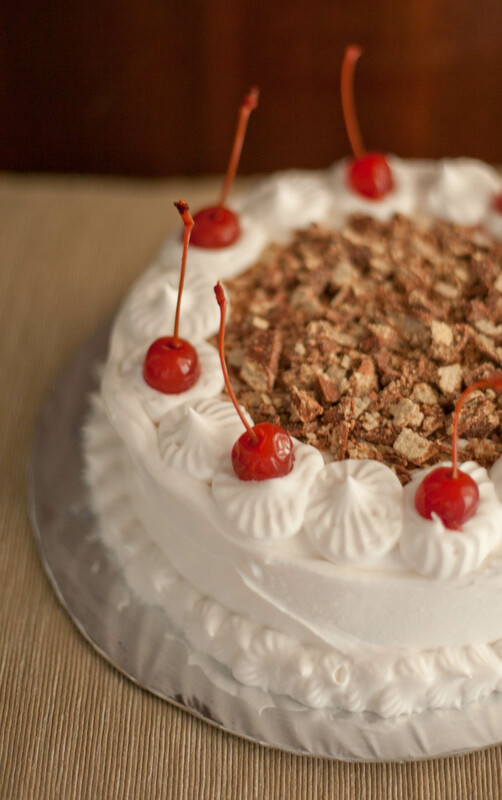 You would want to layer the cake, followed by the cream, then cherries. Cool in the fridge for about 2 hours before serving.